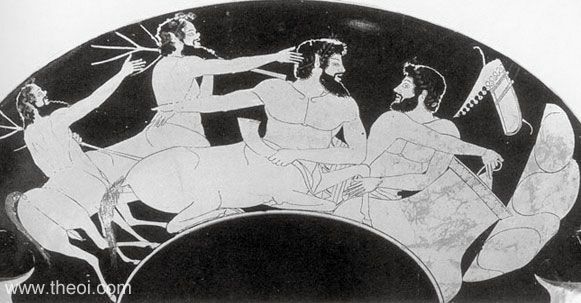 Side A: The centaur Pholus hospitably entertains Heracles in his cave with wine drawn from a buried pithos jar. Pholus is seated and holds a drinking-horn (rhyton) in his hand. Heracles reclines the pithos drawing wine with a jug. His bow and quiver of arrows rest beside him. Two Centaurs armed with tree-branches approach from the left demanding wine with arms outstretched. Side B: Battle of Heracles and the Centaurs (not shown).